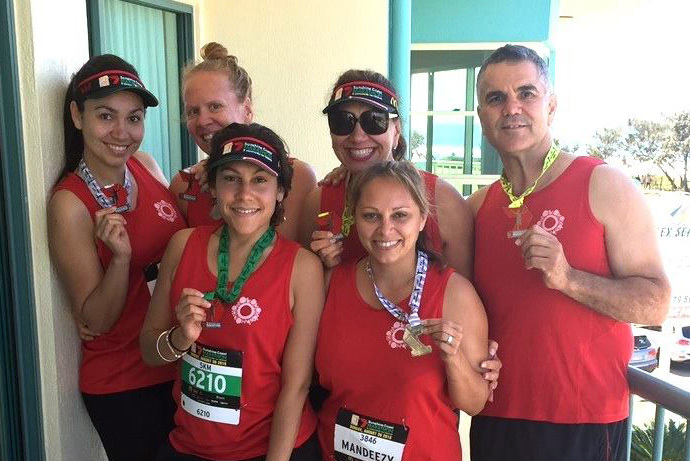 For the third year in a row the ALL STARS have run in the Sunshine Coast Marathon, with the goal of raising awareness and cash for the Indigenous Literacy Foundation. Created by ILF Lifetime Ambassador Dr Anita Heiss, the ALL STARS also raised cash while running in the 2013 City2South in Brisbane. This year’s team included Nadine McDonald-Dowd, Amanda Hayman, Jasmyn Sheppard and Lou Panuel. One team member Kylie Wallbridge had to pull out due to injury and so founder of the Stronger Smarter Institute took on the 21km to keep Anita company. The ALL STARS all believe in the importance of reading in every day life, the role that literacy place in creating equality, and the significant work the ILF does to get books into the hands of Australia’s most vulnerable. This year the ALL STARS raised over $6000 for their running which will go to supporting projects in the 260 remote communities where the ILF works. In 2016, it would be great to see FNAWN members organise a Great Book Swap in your city, town or workplace. For information see the ILF website. There are few more passionate about showcasing Aboriginal and Torres Strait Islander excellence than author Dr Anita Heiss. Last week I was lucky enough to be in Sydney and headed down the Rocks Boatshed at Circular Quay to see Anita yarn with Torres Strait Islander author Sam Faulker. One of a series of yarns that week with ‘celebrities’, this session gave Sam an opportunity to talk about some of the issues involved in creating memoir and biography with family members. She noted importantly, that it’s possible to argue the book had many authors, and is a story that belongs not just to her or the subject, her Grandfather, but to who whole family. Other sessions during that week included yarns with Dub Leffler, Larisssa Behrendt, Michael O’Loughlin, Terri Janke, and Wesley Enoch.